I’ve done a fair amount of blogging about my trip through Spanish Harlem / El Barrio / East Harlem. I don’t know quite how many posts I got out of it (six?). But, I do know that I’ve written a fair amount for just a few hours of wandering. And I didn’t even talk to anyone! And the place was mostly empty of people! But that wasn’t true of Thomas Jefferson Park. It had a few people in it, although I wouldn’t call it a big crowd. 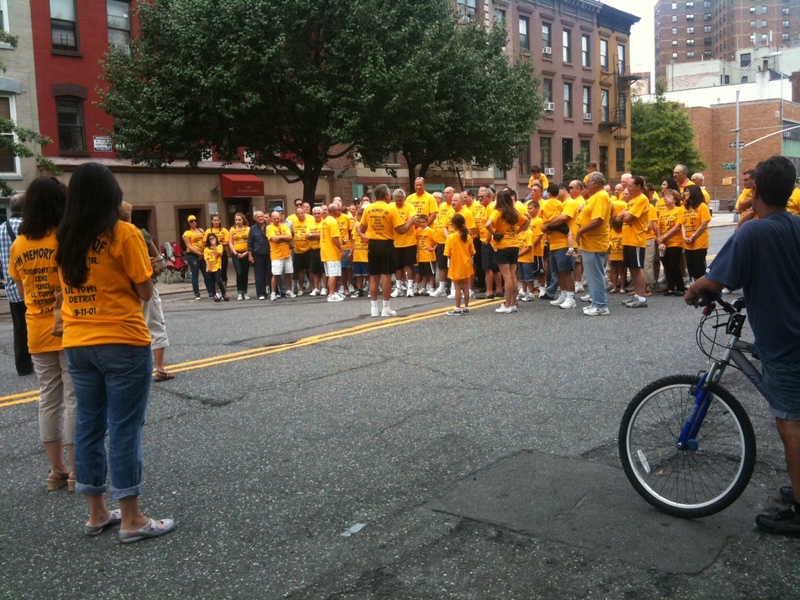 Nevertheless, after finding so few people in Spanish Harlem itself, the light crowds were a welcome sight. 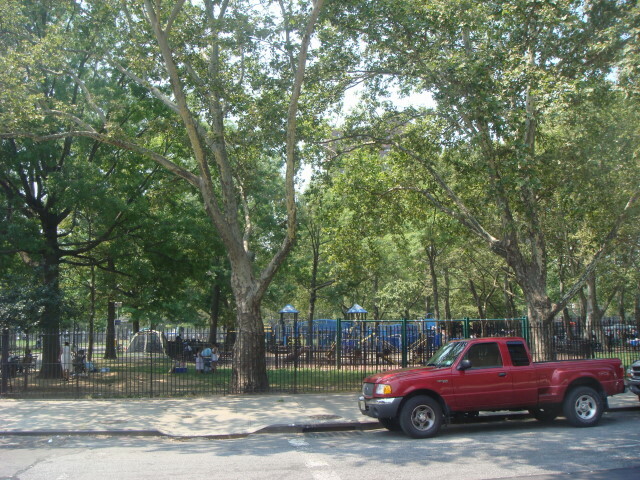 The park is located on 114th Street or so and First Avenue. 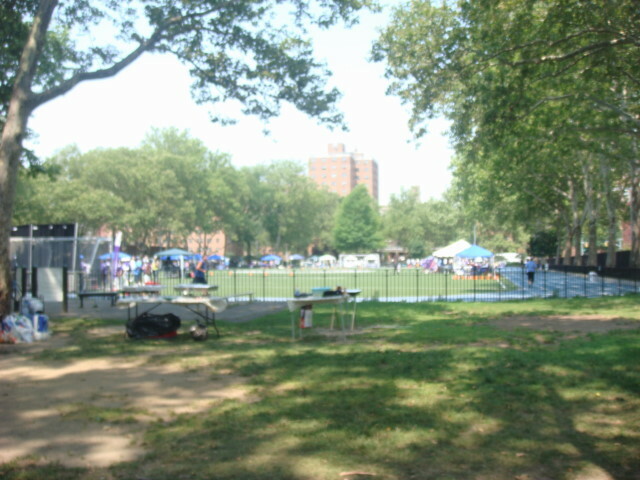 When I first wandered in, the thing I noted was a lot of picnic tables and some sort of organized sporting event that was being prepared. It was on a large running track and included quite a few people. 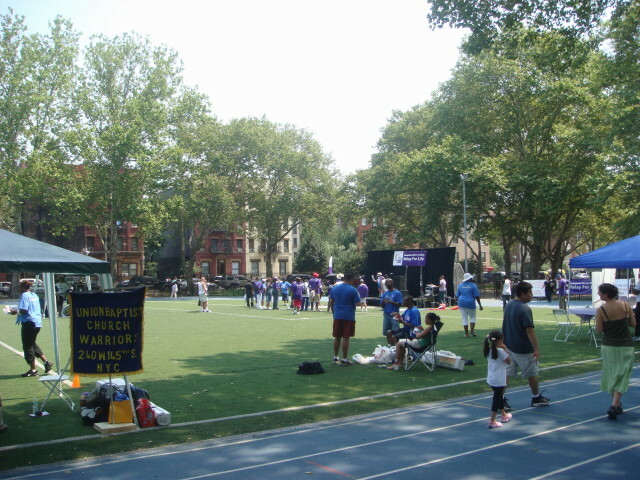 It was a health fair and event called “Run for Life” put on by a local health plan group called MetroPlus. But the thing I really noticed was the pool. Wow, they had a huge, huge pool. It was pretty deserted, but probably because it was near noon and the sun was at the max. The sign for the event said it was an all-day event. I presume the light turnout was due to the heat and time of day. Well, whatever the reason for the light crowds, it wasn’t for the lack of a pleasant area. One last thing about the park: it had public barbeque areas! That’s rare. But the fact that you have to have a permit isn’t all that unexpected. 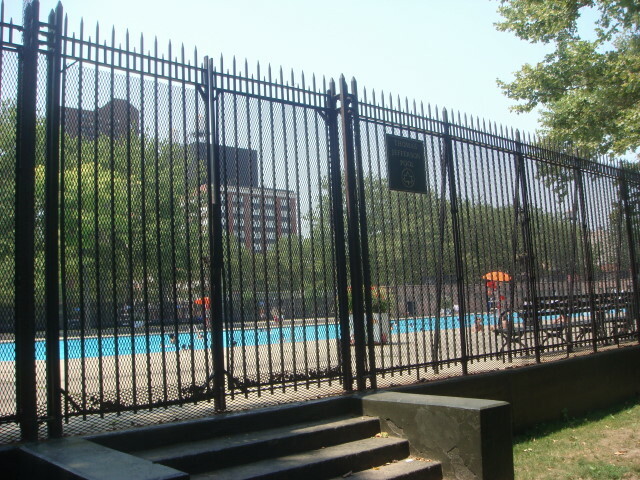 I think that Pleasant Avenue in Spanish Harlem (El Barrio) (and the Pleasant Avenue area is also called “Italian Harlem”) has more community gardens per square foot than any other place I’ve ever seen. At least three. 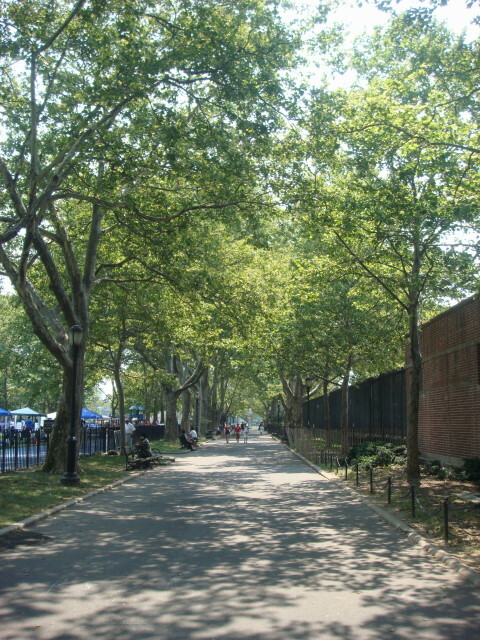 Plus at least one major park abuts it. Very impressive. This is the third of the gardens that I’ve covered. 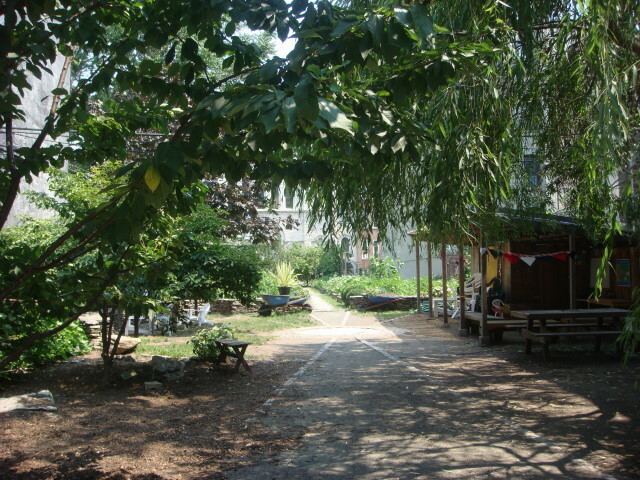 Like all community gardens, the size isn’t large and the entrance is relatively nondescript. Entering, the area is mostly unremarkable, except perhaps for the structure. And of course for the very nice shade. 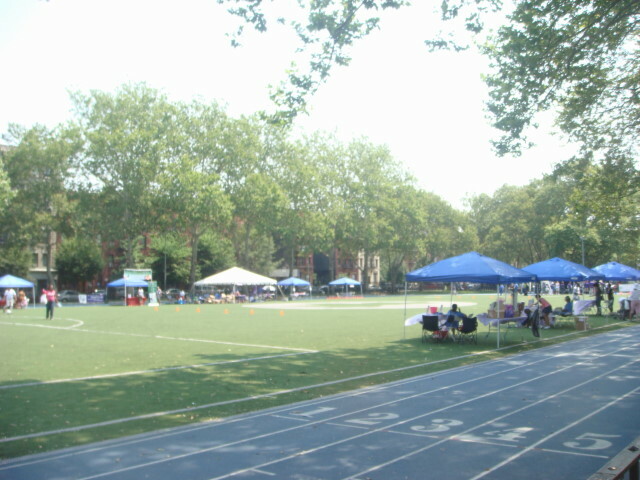 It was hot and the shade was pleasant. That was very welcome to me and I should note that saying is was “mostly unremarkable” shouldn’t be taken as “boring” or other negative. 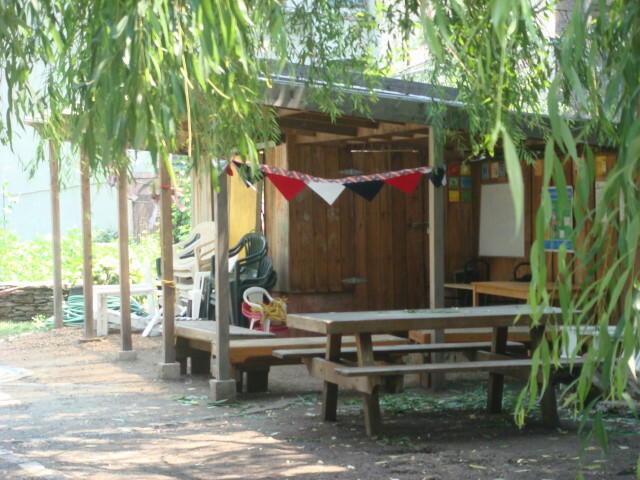 It is a very functional community garden. When I first saw the building, I thought it was just a storage shed. Now that I’ve been introduced to the concept of the “casita”, I wonder if it was so much more. There was a lot of growing going on. And, despite the lack of people in the pictures, I think that it was this garden that was the most actively tended that I ran into that day. I probably saw eight people working away on their personal plots. 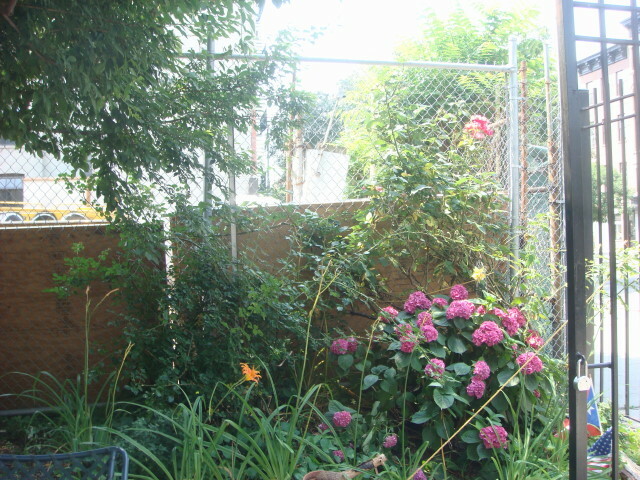 Or, at least what I think was their own little garden areas. 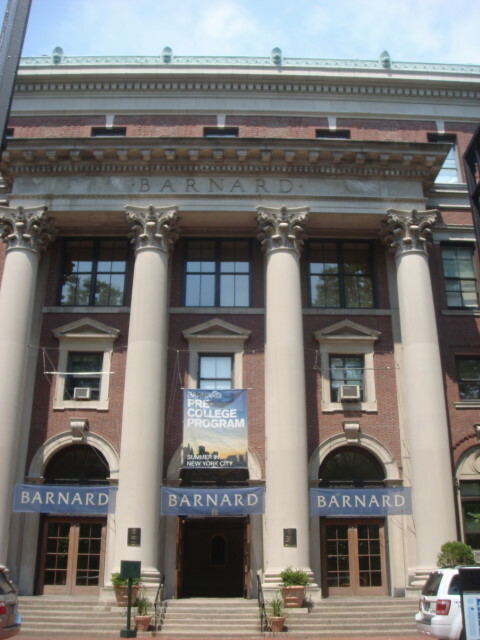 Right smack across Broadway from Columbia University is the much smaller Barnard College. Originally a college for women, it may still be. But I know that male students from Columbia attend classes there as needed. It’s small, compared with Columbia or most any other university that’s as well known. At most, it covers about four blocks although it may be deeper than it looks. I went by it as just a lark to see how big it really was. I had done it a long time ago and I think it is about as small as memory serves. From what I understand, there are only a couple of thousand students enrolled. But since Columbia students can cross over, it makes the potential attendees much larger. I passed by what I think is their main gate and noted that they had several privacy signs up. I felt at ease wandering around Columbia, but this place seemed a little more restrictive. So, I just kept walking. I really liked this bench. I mean, it was so simple and plain and ordinary that I might have passed right by it. And I probably have during my several visits to the campus over the past couple of years. It’s just a simple stone bench. With a good inscription and provenance. It’s hard to read, and I doubt you can see it on the above picture, but engraved on the bench’s back are the following words: “To fellowship and love of alma mater 1886 Arts, Mines, Political Science; 25th Anniversary.” So, I presume it was presented to Columbia sometime around 1911. In terms of gifts and the like, it’s absolutely top notch. Well, maybe not quite as good as the lampposts I cited earlier; but still really nice. 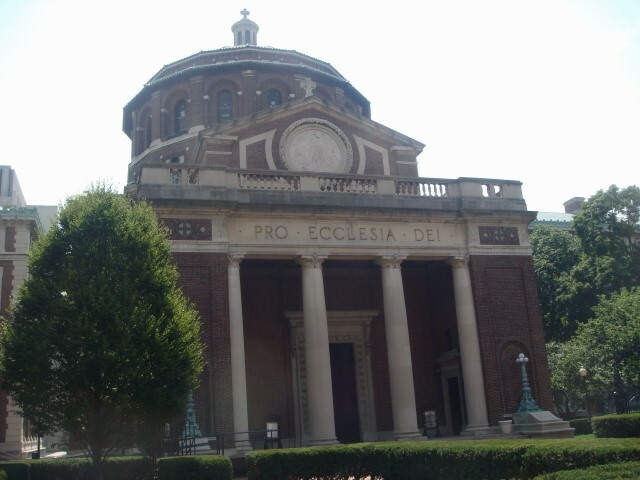 One of the most aesthetically pleasing buildings within Columbia University is, wouldn’t you know it, a church. Or, rather a chapel. St. Paul’s Chapel, by name. As an Air Force brat, I’m used to chapels and their distinctly multi-sectarian focus. I wasn’t surprised to note that they have Jewish services and even have a Moslem prayer group. I do admit being surprised to see that they actually have a Hare Krishna study group. I don’t know why, but I was. It was originally founded as a Episcopal chapel, but that’s pretty much gone by the wayside, I’d guess. There’s a printed history outside the doors that details a bit of the chapel’s history. 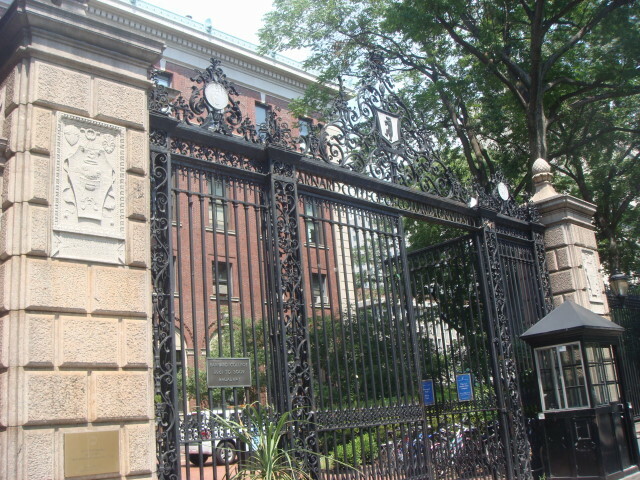 It was designed by Newton Phelps Stokes (and makes the point that he went by “Newt”). Well, Newt thought that St. Paul’s was his masterpiece. 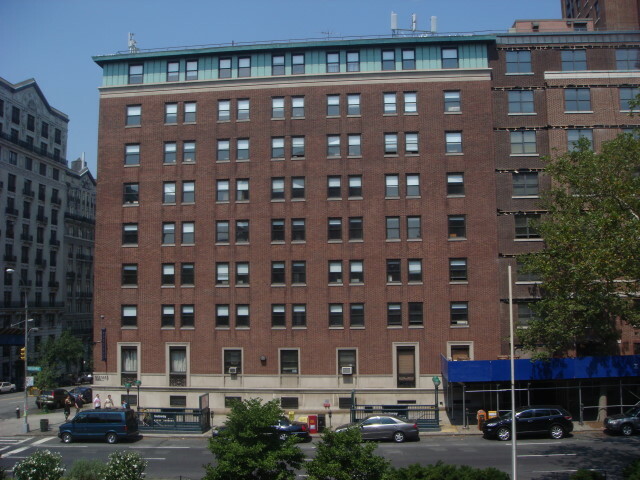 The building was started in 1904 and dedicated in 1907. 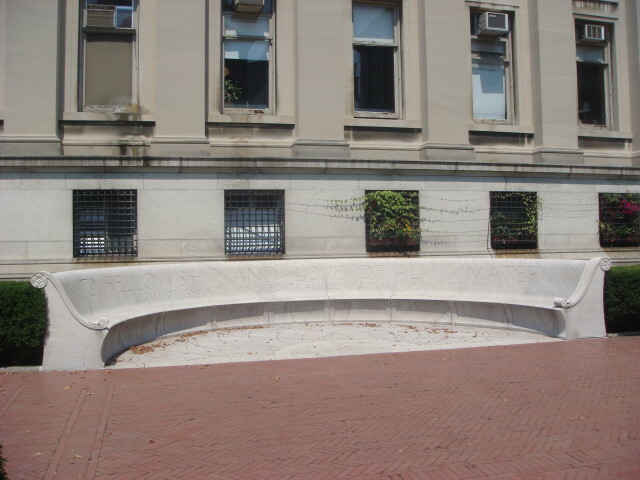 To be honest, I don’t know if it is a real masterpiece (although I note that it was honored as an official landmark by the NYC Landmarks Preservation Commission in 1966 and probably more than qualifies as one). 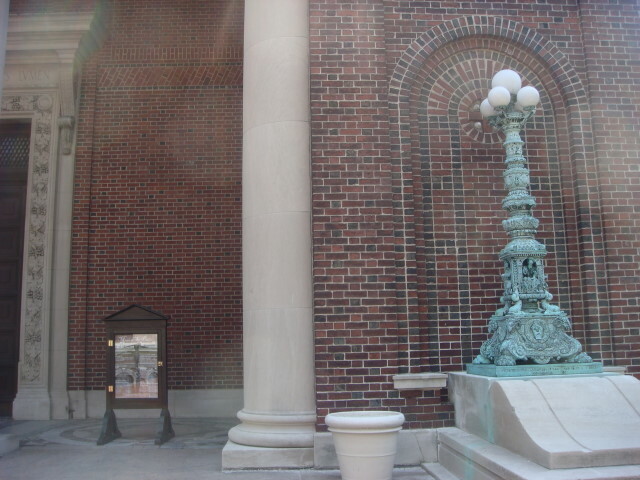 But I really like the lampposts outside the doors. There are actually two of them, on on each side of the door. 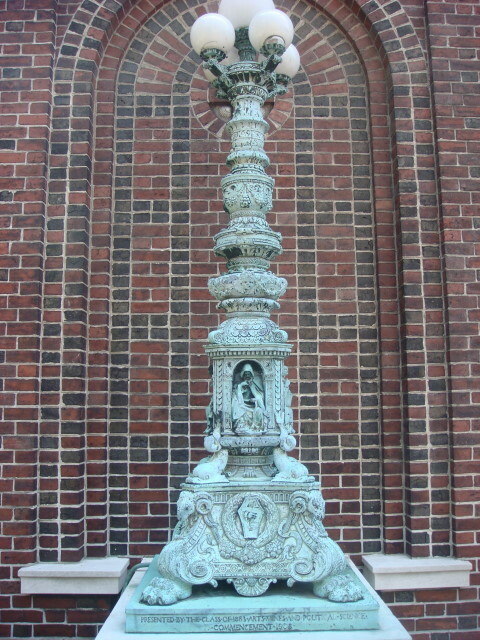 They were donated by the Class of 1883 during the 1908 Commencement. I mean, look at these things. Ain’t they magnificent! 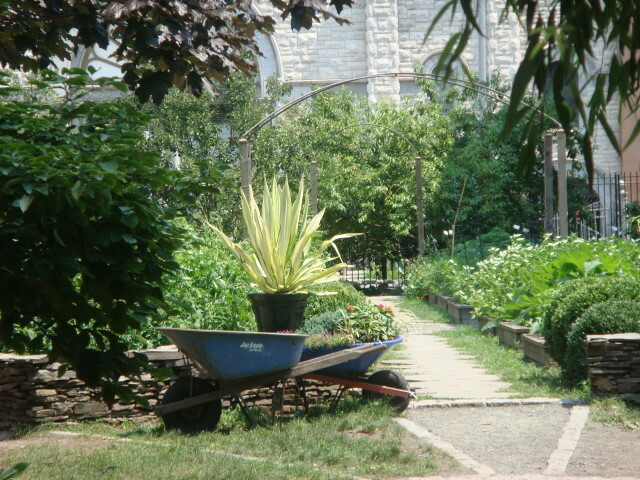 When I was in Spanish Harlem recently, I came across a number of community gardens. 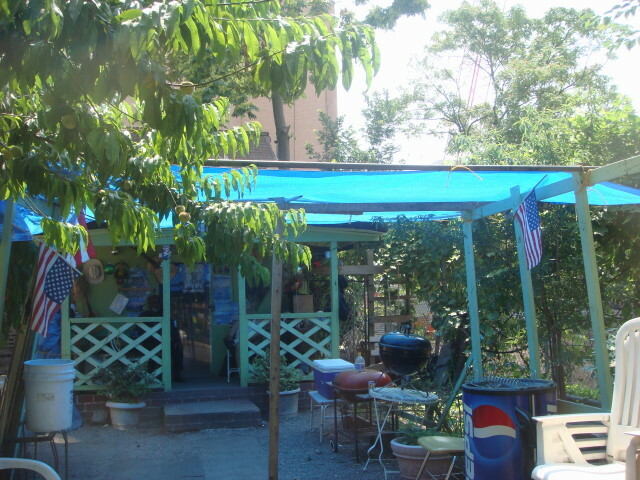 The most absolutely unusual one I have ever seen is right there on Pleasant Avenue and has the very “Barrio” sounding name of “Los Amigos Garden and Casita”. The key to the “unusual”-ness of it is the word “Casita”. I hadn’t seen it on a community garden’s name before. It turns out that the word means “little house” and refers to a small house within the garden area. Imagine my surprise when I walked into a community garden and saw the below. It was actually occupied. I thought I had wandered into someone’s yard and was trespassing! There were a few well-humored guys there (no English that I heard) and they motioned me to go on up to the house. But I felt like an intruder and took a couple of pictures and moved on. It wasn’t until later that I discovered the concept of casita and realized it might have been a real treat. 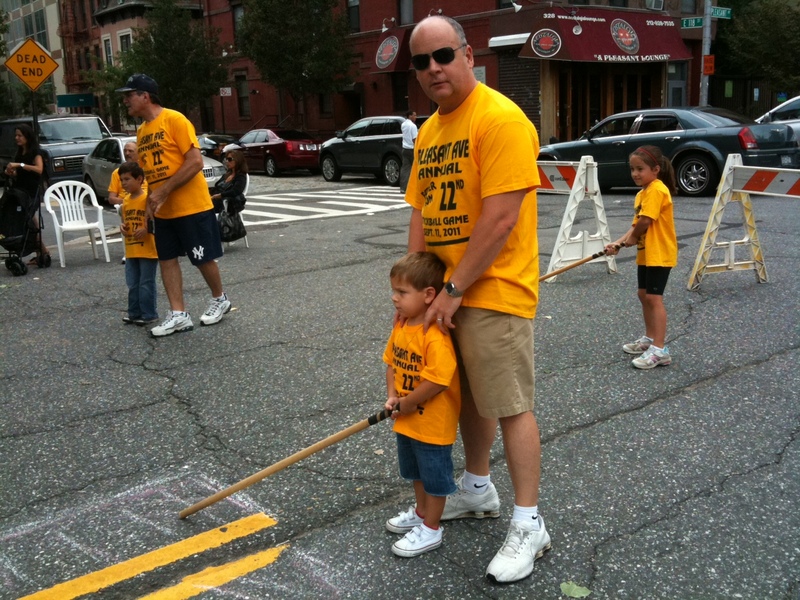 But, then I really don’t know the rules of the house and whether it is only for community contributors and the like. It doesn’t really matter. 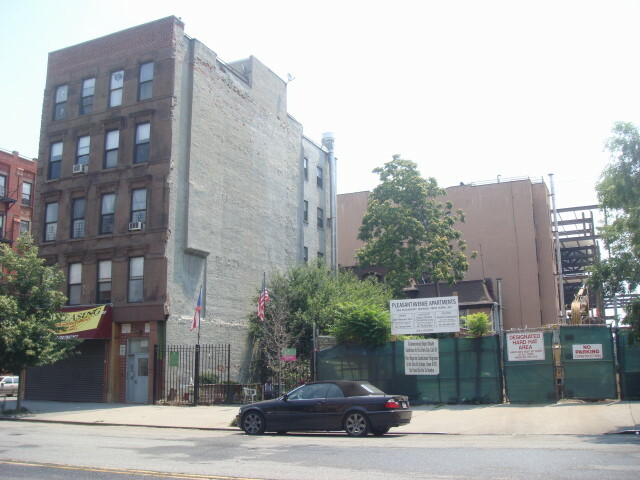 I wanted to see something unusual in El Barrio and I got something rather nice and special. To bad for me I didn’t know it at the time.